I like to take care of my friends, which is why I commissioned this guy to entertain you today with a recipe for booze. Yes, booze! And what’s better than booze? Why, booze dedicated to your dog, of course! “I’m as obsessed with cocktails as Dr. Roses is obsessed with Boston terriers. 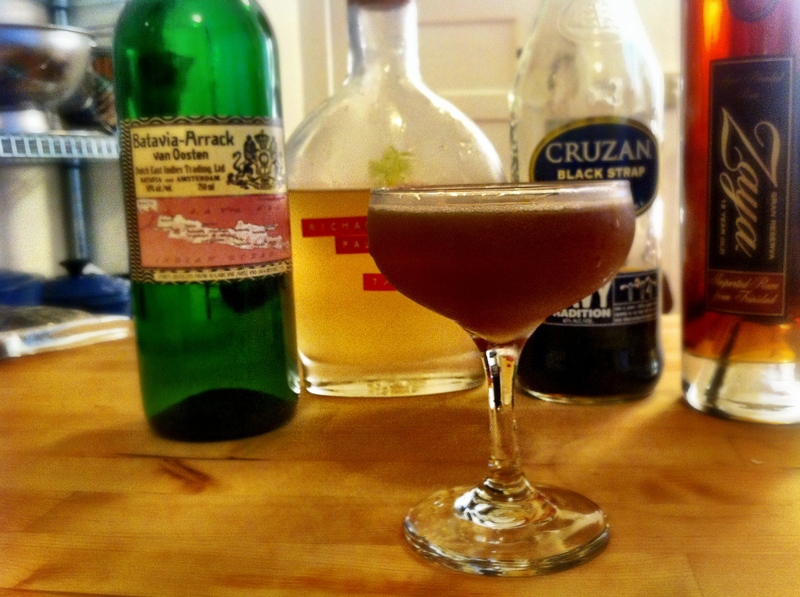 Sometimes I mix other people’s drink recipes, but just as often I try to come up with cocktails of my own. So when the Doc told me that she’d finally found Ace, naturally I started thinking about how to formulate a signature cocktail that was worthy of the occasion. “Metaphorically, I wanted to create a cocktail that reflected some of Ace’s most notable traits. I knew I wanted it to lean sweet—but not too sweet—with some spiciness and a little bite. And I wanted to somehow capture the awesome white stripe on Ace’s backside. “For a drink that leans sweet, I always think of rum first. I decided to mix a couple of different rums to get some of the best qualities of each. For the spice, I started with Kraken spiced rum and added homemade falernum, a witches’ brew of overproof rum, ginger, cloves, lime, and allspice. And for the bite, I used a splash of Batavia Arrack, a delectable but unruly spirit that’s distilled on the island of Java from fermented red rice and sugarcane. “Cut the pith away from the citrus peel; discard the peel. Shake all ingredients with ice, omitting the citrus pith. Strain into a cocktail glass. Float the pith on top of the drink, towards the side of the glass. Just noticed that the photo shows a bottle of Zaya rum instead of Kraken. The Zaya was an experiment that didn’t work out all that well. Stick with Kraken.